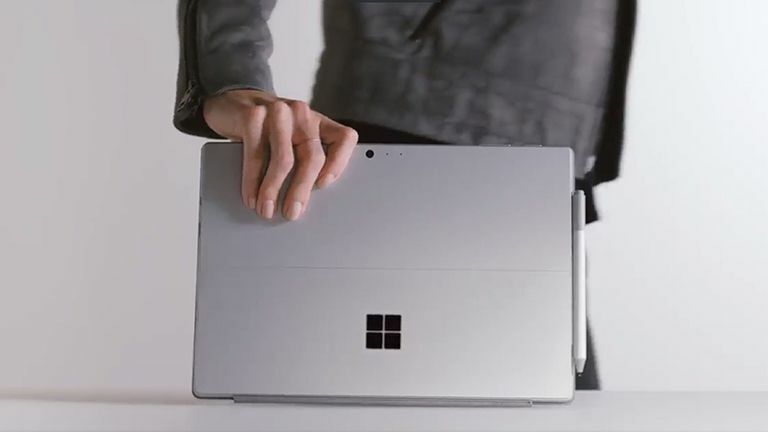 Microsoft has officially unveiled the new Surface Pro, the successor to its popular Surface Pro 4 laptop-tablet hybrid, as well as the Surface Laptop at the company's event in Shanghai, China. The new Surface Pro, images of which leaked late last week, is lighter than the Surface Pro 4 (weight sits at 1.7lbs), has a redesigned speaker system, comes packing an Intel Core i7 (7th Gen) processor, a 12.3” PixelSense touch display (267ppi and 3:2 aspect ratio), a 13.5-hour battery life (that's 50 per cent more than the Surface Pro 4), a quieter internal fan (18dB with core i7 installed), next-generation hinge-system and a tilt-sensitive Surface Pen capable of 4096 levels of pressure. There are also new Alacantara keyboards and a Studio Mode, while support for LTE Advanced will be available in units shipping later in the year. The new Surface Pro will start at $799/£799 (top spec is $2,699/£2,699) and offers an array of colour-on-colour options for the new Surface Pro Signature Type Cover, new Surface Pen, and the Microsoft Surface Acr Mouse. The new Surface Pro will launch on June 15, 2017, in 25 markets. Pre-orders for the new Surface Pro and Surface Pro Signature Type Cover are now live in select markets at Microsoft Store, Microsoft.com, BestBuy.com, and JD.com where available. The new Surface Pen will be available in the coming weeks. Microsoft also announced that its HoloLens Development Edition and Commercial Suite is now available in China. We had mixed opinions on HoloLens when going hands on with the system last year, however, there was no doubting the quality of the technology on display or its potential applications, so this can only be a positive step forward. For more information about the new Microsoft Surface Pro, as well as the Surface Laptop and Microsoft HoloLens, then check out the Microsoft Blogor Microsoft's online store now.